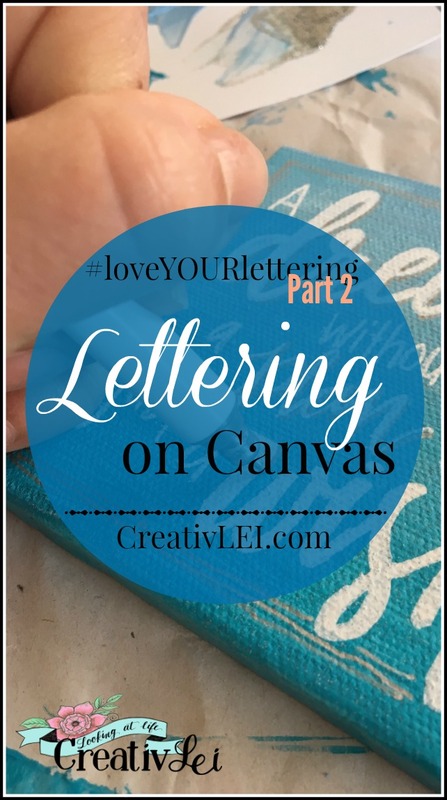 Now that your skills are growing, lets think off the page and consider lettering on canvas. This week is definitely a more ‘artsy’ week, but I’m still going to keep it completely ‘do-able.’ After building up your lettering repertoire, we’re taking our skills onto various surfaces, starting with lettering on canvas. 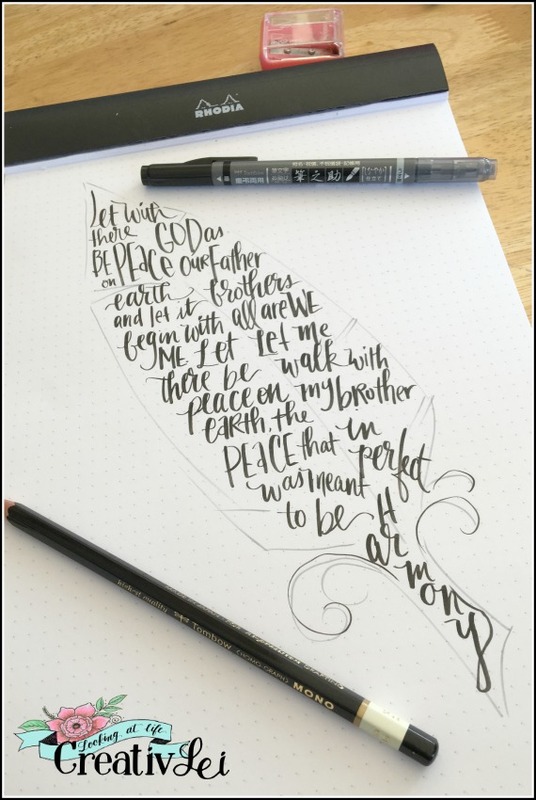 One of my favorite aspects of lettering is that it can be used in such interesting ways. You are not bound to a notebook and drill papers! 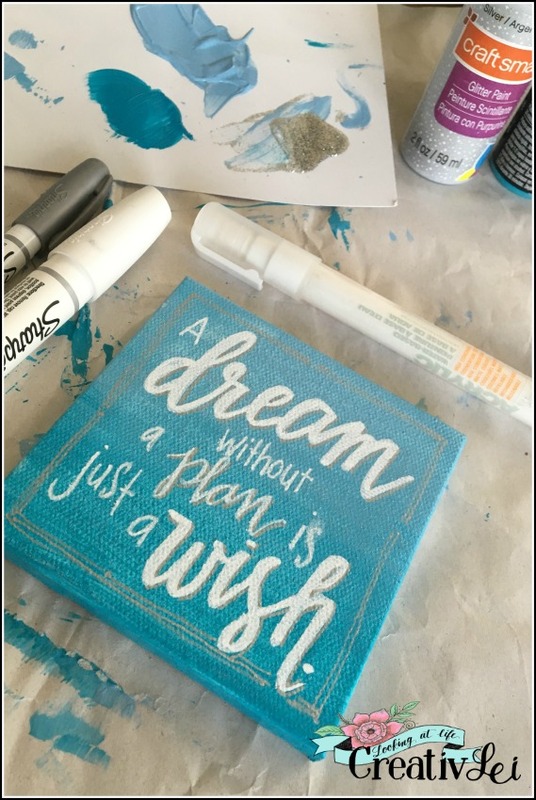 You can create simple lettered canvases. Canvases are easy to find locally. Michaels often runs good sales throughout the year and that’s when I stock up on a large variety of canvas sizes. I like to have everything from tiny ‘ornament’ sized to giant wall canvases ready in my stash. 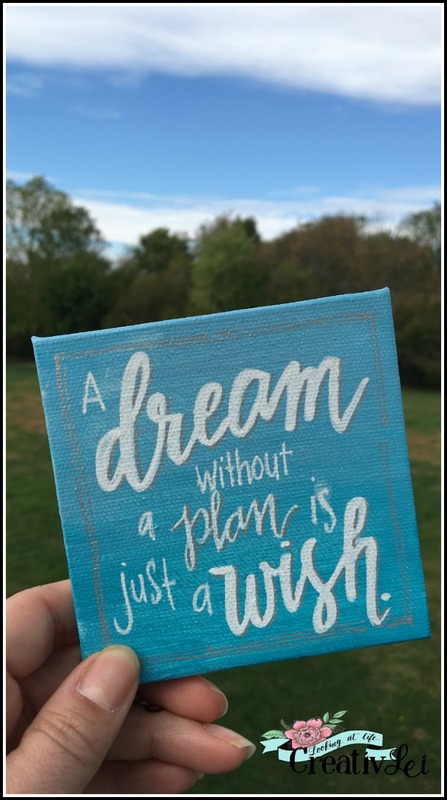 Hand-lettered canvases make great gifts. Start by painting a simple background. With two analogous (on the same wedge of the color wheel) colors, you can create an easy ombre effect. You could certainly use more colors, but I’m keeping it simple so that you will be willing to try. This background was accomplished using simple craft paints. I prefer the satin finish and there are tons of colors available very inexpensively, especially during a sale. After painting the background, you have to allow it time to dry completely before beginning to letter. On small canvases I may pencil out a basic layout on scrap paper so that I can work out spacing, or I can letter off-the-cuff. For a larger canvas, once the paint is well-dried, I may sketch my layout lightly with chalk before lettering with a paint pen. Paint pens make lettering on canvas quick and clean. 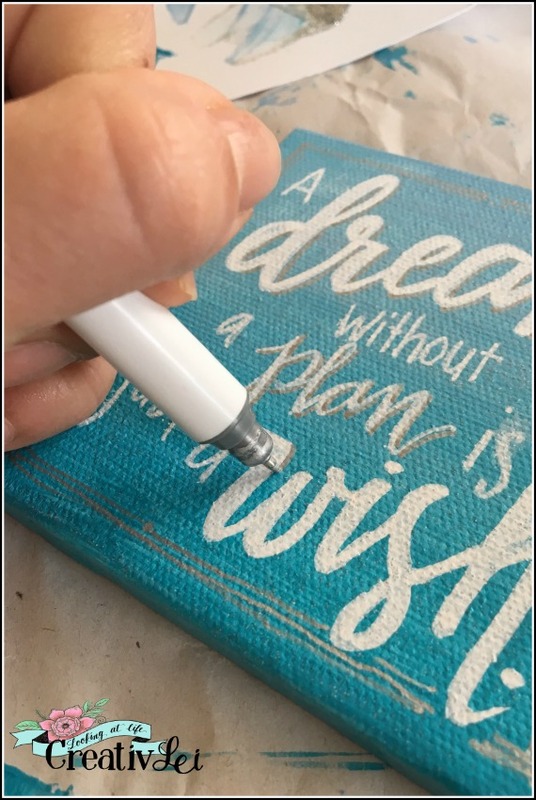 You could certainly use a paintbrush to letter on canvases, but since we’re talking about just getting started, paint pens are a perfect tool for beginning to letter on canvases. I prefer the water-based paint pens. The paint goes on nice and opaque. You could use an oil-based pen if that is all that’s available to you. Keep in mind that it will take longer to dry between layers and may soak into the canvas, requiring more than two coats for adequate coverage. 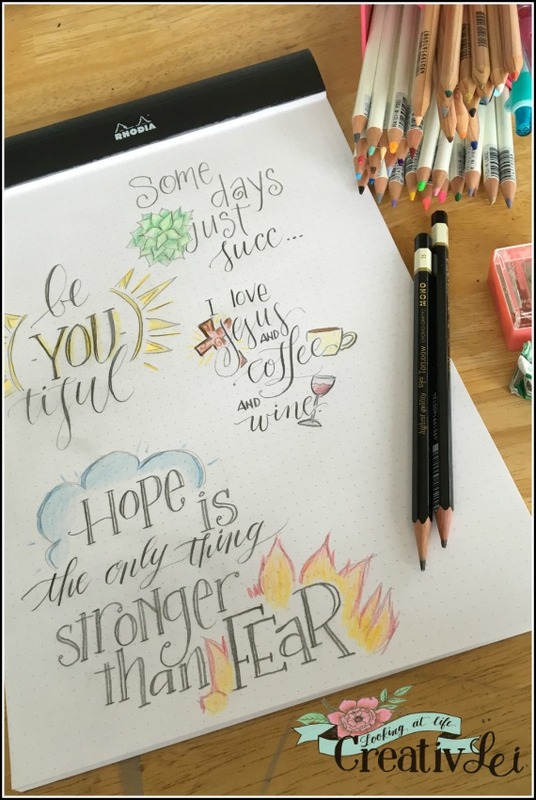 Mix lettering styles for a fun and interesting look. To ensure durability, I like to spray my finished canvases with a clear protective coating. This gives it a nice shine and once cured is easy to clean. A calligram is a picture made out of words. Here’s the fun part, you do not need to be a great artist to make beautiful calligrams. A creative calligram can make a beautiful gift. When I was first learning calligraphy back in high school (seemingly forever ago), almost everyone received a calligram for at least one occasion that year. My favorite pieces were hearts I personalized for each couple receiving them. I wish I could dig up pictures, but that was pre-digital era and I live a few states away from my childhood home. 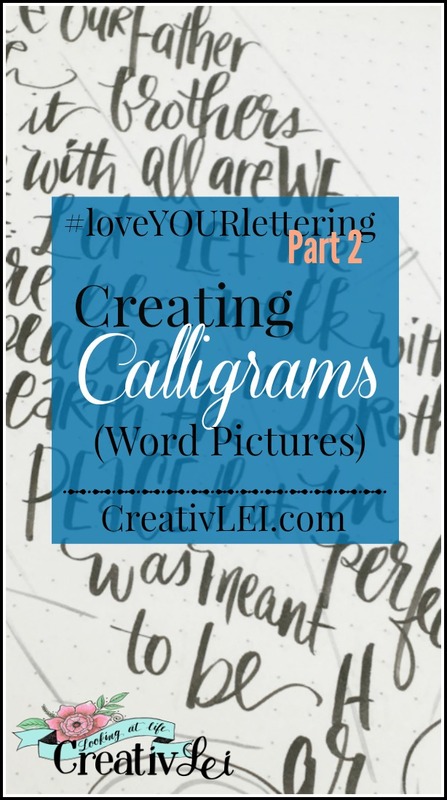 Let’s get started creating calligrams! You can start by drawing the silhouette your want your words to fill. For this project I created templates that I could slip under my work. This really helps if you’re going to create a few of the same theme! You’re welcome to download the feather and anchor templates for personal use. An encrypted link for the files will be delivered to your inbox. The link will expire after 4 download or 4 days, whichever comes first. I had already chosen the lyrics for “Let There be Peace on Earth” for my feather. I drew out the verses down each length of the feather. While I want the words to be readable I’m not completely focused on each word being on the ‘proper’ line since this calligram is primarily a piece of art. Once you’ve found templates or drawn in silhouettes you like, the sky is the limit on the type of calligram you can create. 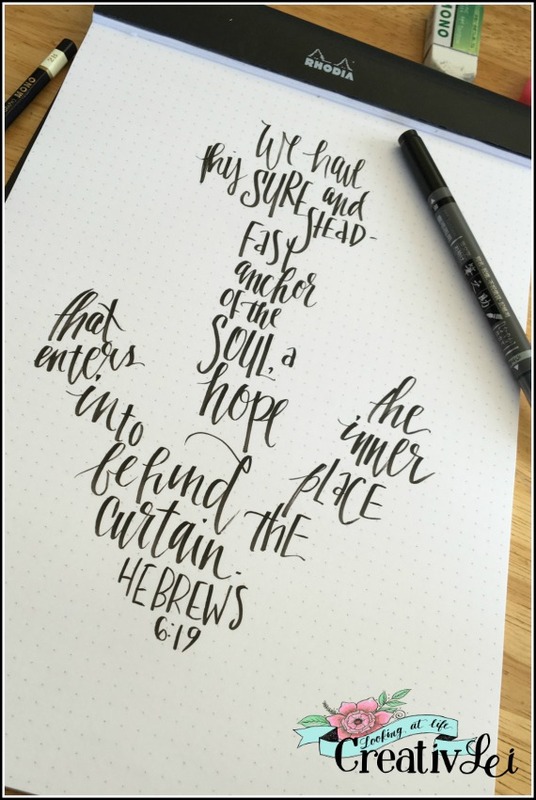 My next piece was an anchor with a verse from Hebrews. This time I didn’t pencil in my words first, instead I let the placement happen off the cuff. 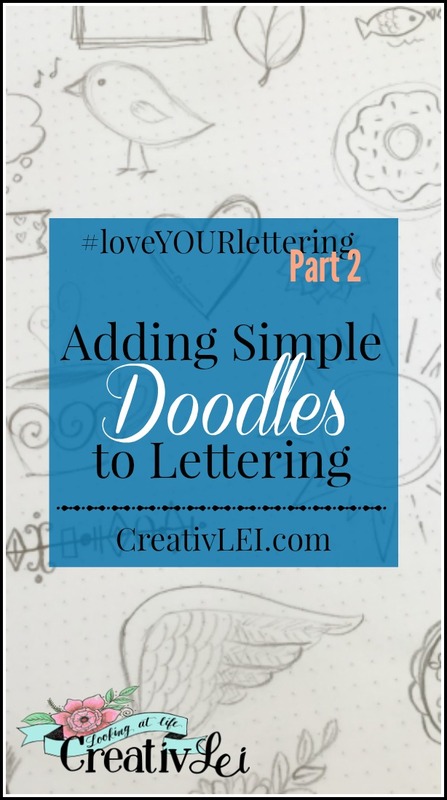 Once you’ve built your repertoire of lettering styles another way to add pop to your designs is to start adding simple doodles and motifs to lettering. I use doodles to help convey the message I’m trying to send through my layouts or to bring emphasis to certain words in the design. Today, you’re going to give it a try! I’m not asking you to break out the into realism and mimic the masters. That’s not why we’re here. 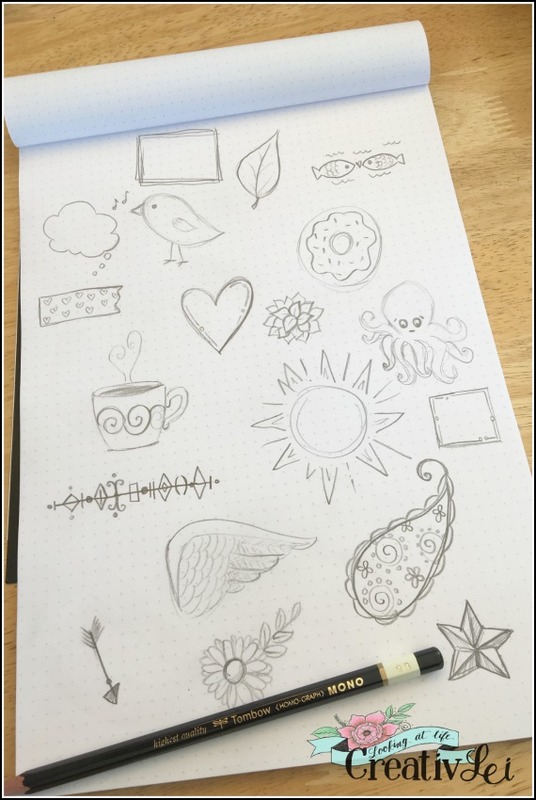 Let’s doodle out simple shapes into some fun design elements, like coffee cups, fishes, birdies, and leaves. 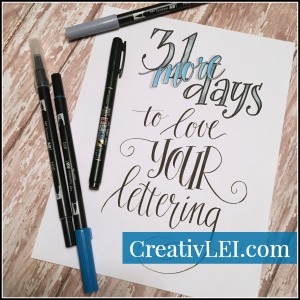 Once you’ve warmed up your doodling muscles, pull out some of your practice lettering pieces… even the ones that aren’t your favorite or best work. Use your practice pieces to experiment with adding simple doodles! Have fun with the process. Not every doodle I create works, but I keep on doodling and encourage you to do the same. Doodling is much less about the results than it is about the process. 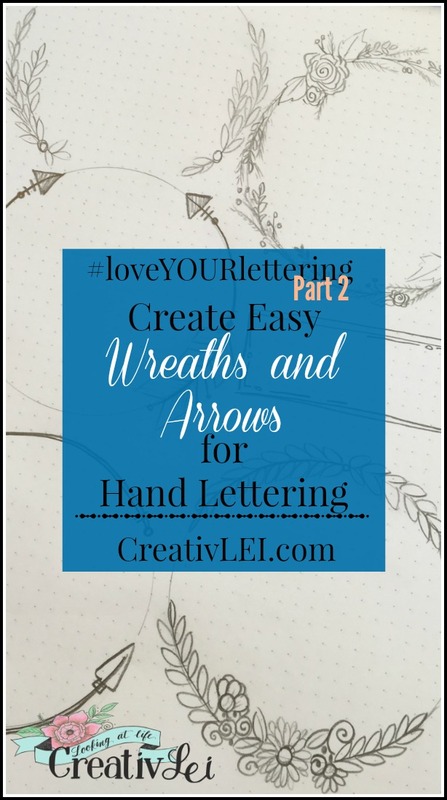 Now that you’ve given drawing banners and buntings a try, are you ready to create easy wreaths and arrows to use in your hand lettering? 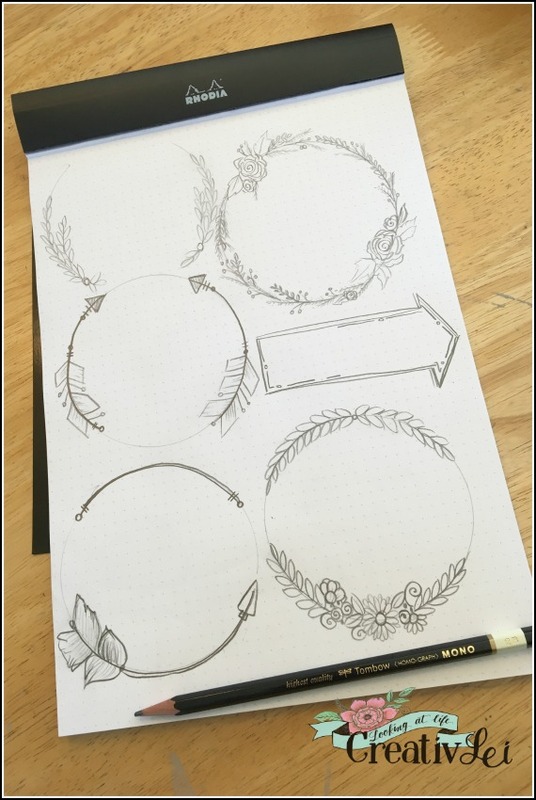 You can draw these wreath designs! I can sense your apprehension, because these elements are going to require a little more drawing. Keep in mind that fine art is not our goal here, we’re creating doodles that add interest to our over all design. I use basic shapes like tear-drop leaves, spirals turned into flowers, or loopy daisies to adorn my hand-drawn wreaths. When drawing arrows, I like to keep them simple with basic geometric shapes and sketch in feather textures. It helps to let go of the idea of creating perfectly straight lines. Remember that when you are doodling by hand it should look hand-drawn, not always crisp and clean lines. You can keep them as simple as you like, and just add small details to bump up the design aesthetic.